Staff Sgt. 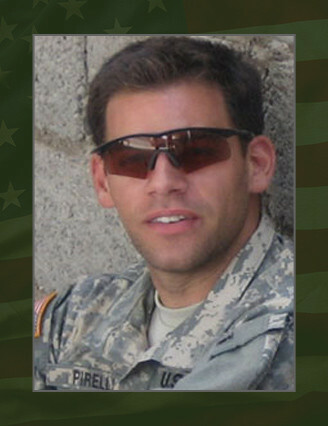 Robert R. Pirelli, was killed in action on Aug. 15, while conducting combat operations in the Diyala Province of Iraq, while serving with ODA 072, Company A, 3rd Battalion, 10th Special Forces Group (Airborne). Pirelli, 29, of Franklin, Mass., enlisted as an infantryman in Dec. 2003. He later attended the Special Forces Qualification Course, graduating in 2005 and was assigned as an engineer sergeant with 10th SFG (A) Fort Carson, Colo. He had recently begun his first tour of duty in Iraq in support of Operation Iraqi Freedom (OIF) as a member of the Combined Joint Special Operations Task Force – Arabian Peninsula. Pirelli’s military education include; the Basic Airborne Course, the Warrior Leaders Course, the Basic Noncommissioned Officer’s Course, Special Forces Qualification Course, and the Arabic Basic (Modern Standard) Language Course. His awards and decorations include two Army Good Conduct Medals, National Defense Service Medal, Iraqi Campaign Medal, Global War on Terrorism Service Medal, Noncommissioned Officer Professional Development Ribbon, Army Service Ribbon, Overseas Service Ribbon, Combat Infantryman Badge, Parachutist Badge, and the Special Forces Tab. Pirelli is survived by his parents, Robert and Nancy Pirelli; brother Shawn, and sister Stacey, of Franklin, Mass.